Beltran is not the only one who has noted the creative drain of the city. Earlier this year, the San Francisco Arts Commission released an online census to collect information on the displacement of artists due to rising rents. While the results are yet to be released, the 2015 data from a similar census painted a bleak picture, and since then the average rent on a one-bedroom unit in San Francisco has climbed to almost $3,700 a month. In response, one of the projects to receive a CCA Impact grant is House9, which aims to both improve existing spaces and create new ones for artists through environmentally friendly infrastructure, like an innovative water-processing system and hydroponic unit for growing produce. 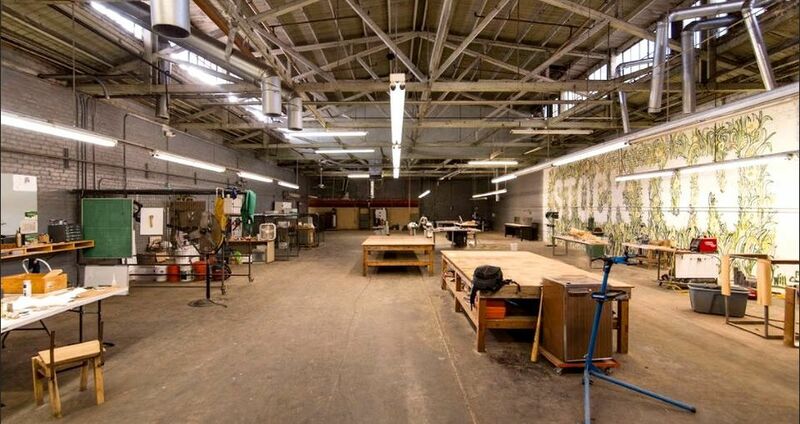 The other is a new development called Hatch Workshop, which aims to offer training in fine crafts and design as well as affordable housing, workspaces and shop access for emerging artists. Trent is among those who were forced further afield to find adequate space. Hatch Workshop is located around an hour-and-a-half outside of San Francisco, in Stockton, California. Trent’s plan, which is already in process, is to convert existing warehouses and a defunct hotel into a studio/home/exhibition incubator for artists, designers and makers who work with metal and wood. Fourteen affordable studios that include accommodation will be rented out through a portfolio-based application process geared towards emerging artists that opens this autumn, with the aim of filling the spaces by spring 2019. Hatch is also offering a residency programme for more established artists and makers who will be able to live and work in the space for free, in exchange for teaching classes and contributing toward “a collaborative environment”. The warehouse will also offer free after-school workshops for local youngsters. In addition to the CCA grant, Hatch has received $100,000 worth of machines that were already being stored in the space and have been loaned by the San Joaquin County Office of Education in exchange for free membership for 50 students. They have also secured a free first-year lease from a sympathetic developer that covers two 7,500sq. ft warehouses, a 5,000sq. ft lot and an adjoining, three-story, 15,000 sq ft hotel. Trent is now seeking investors to help him purchase the spaces, which is estimated to cost a combined total of $800,000 to $1.5m. The constraint on affordable spaces for artists to live and work in the Bay Area has also been shown to have deadly consequences. In December 2016, Ghost Ship, an artist’s collective in an Oakland warehouse that did not meet fire regulations, burned down leaving 36 dead. The collective’s creative director and master tenant are scheduled to stand trial for 36 accounts of manslaughter on 16 July; each could serve up to 39 years in prison.